Squash House Quilts: Dressed to Cook! A while back I mentioned I helped out the local economy at the Quilted Strait in Port Gamble. I just finished this adorable apron. The pink gingham came from the Quilted Strait. The apron print fabric was something a dear friend saw and thought I should order! Was she ever right to send me that link! 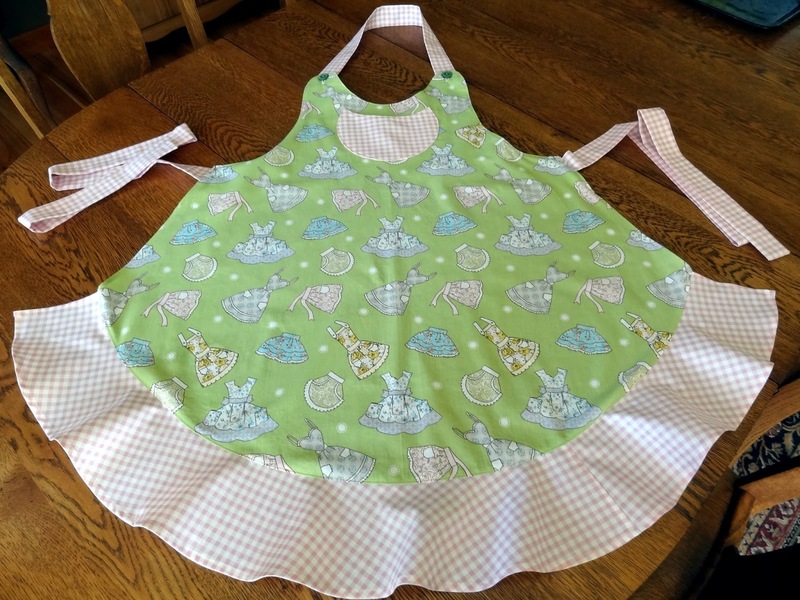 I love the fabric and knew I had to make an apron with it! The pattern is Sassy Little Apron by Cabbage Rose. The buttons are vintage buttons also given to me by the same friend! I had a lot of fun making this - it's quick and easy. Many of you have asked about the colored designs on my Sweet Stitches BOM. I can't respond to some of you because you come to me as noreply-comments. This means your email is not attached to your comments. They are iron-on appliques and are prints from Kathy Schmitz's original watercolors. Next week Mr. Squash and I are off to the West side of the state for a few days. We hope to fly fish some of our favorite fishing holes that we haven't visited since we retired! Stay tuned for some fishing posts! What a cute apron!!! I always like the idea of an apron, but have never found one that was comfortable for me. What a darling apron Candace. Are you going to wear your apron while you fish? It's not going to match your hip waders! What a visual. The gingham is just perfect with the apron fabric. :o) And well...I heart the buttons. How exciting to get some fishing in. Looking forward to your fishing posts. That is one cute apron...you have some nice friends, Candace. Good luck with your fishing. Hope you get the big one!! That is ADORABLE! The fabrics are terrific too. Now, that's a pretty apron. Don't spill on it! GREAT apron! Love the fabrics. Looks perfect for preparing a great Tea Party! Have fun fishing! Are you going to share a link to that adorable fabric? Wishing you the most luck and great casts! Can't wait for to read about your fishing adventures! Have fun and catch and release lots! What a fun apron and the fabric and vintage buttons go together so well. It'll be a shame to get it dirty. Maybe it's just meant to hang on a hook in the kitchen and look pretty? What a cute apron! The fabric couldn't be any better - just cute! My aunt made us matching Christmas aprons for our annual cookie-bake - so fun. Have a great time fishing! aprons on an apron. super cute. wishing you good fishing. So pretty! The pink gingham is really sweet and the apron fabric is sure to bring smiles! Perfect buttons too! Have a safe and happy trip, Candace! Friends I Love to Visit! Long Johns on the Line! Our Very Own Barn Quilt and a Treeless Apple! Quick as a Squirrel Finish!